JK, they’re #1. Right up there with my waist being wider than my hips and the fact that I haven’t yet won the lottery. As a former aspiring songwriter (my saddest label) I like to make up songs about my life. “Where did you go/ My strainer” sung to the tune of No Mercy’s “Where do you go?” is on heavy rotation in my kitchen and “I don’t want to go to work,” my folk tune original has topped my Monday morning charts since 2010. The bed bugs and all of the information I’ve learned about them have provided me with ample material for a host of songs. Ha ha, get it? Host. Because I’m being eaten alive in my own apartment… too soon? FOR A LIMITED TIME ONLY, GET THIS YEAR’S TOP HITS. “NOW: THAT’S WHAT I CALL A BED BUG INFESTATION! !” IS AVAILABLE TODAY FOR ONLY $19.99. AND GUESS WHAT? THERE’S MORE! BUY IT IN THE NEXT TWO HOURS AND GET A PACK TITE TOO! THAT’S A $319.99 VALUE FOR ONLY $19.99!! The video to that one is great because it opens with a minute and a half of Taylor dramatically inspecting her suitcase after returning from a stay at the Ritz Carlton while talking about how she felt compelled to keep it on the floor even though she’d been burned before. Something about the carpeting was calling to her. 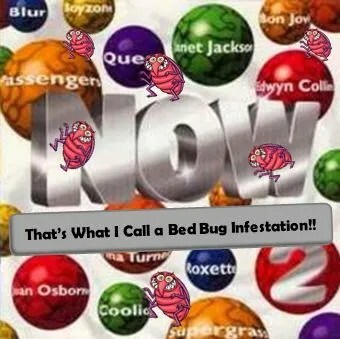 ACT NOW OR MISS OUT ON THIS ONCE IN A LIFETIME OPPORTUNITY TO GET YOUR COPY OF “NOW: THAT’S WHAT I CALL A BED BUG INFESTATION!” AND YOUR VERY OWN PACK TITE! CALL US IN THE NEXT 5 MINUTES AND WE’LL THROW IN A NOW RUBBING ALCOHOL SPRAY BOTTLE!